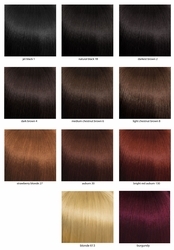 My Diva's Closet exclusive color chart, photographed as close to the real shades of our wigs as possible. It will still vary depending on your monitor setting, but unlike so many stores this is not a generic *copypasta* color chart floating somewhere on the web. We shot this on the wigs we offer, so you can find shades closest to your desired color.